Cosy, fully renovated cottage on a small farm, ideal for a nice, natural holiday. The cottage lies near a forest and is ideal for walkers and nature lovers. The cottage has an authentic feel and a beautiful fireplace. You will also find a games room with pool table in the cottage. The owner lives in the farmhouse attached to the cottage and offers the possibility to get close to some of his animals such as goats, cows, chickens, rabbits, sheep and dogs. 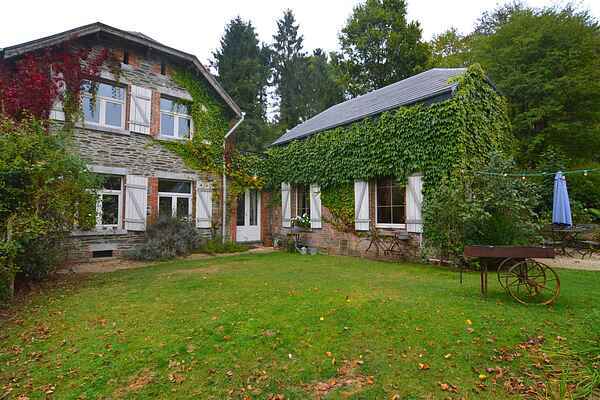 The house, located in a beautiful hilly area with forests and beautiful panoramas, is a few kilometres away from the valley of the Semois and at 25 kilometres from Bouillon. The centre, with restaurants, is located 3 kilometres from the cottage and the shops are 5 kilometres away. In the region there are as many as 90 walking trails and 17 mountain bike trails.